Manufacturers part number 189755 - 1/2" wide VELCRO® Brand ONE-WRAP® Tape is perfect for bundling a wide range of materials, cables and tools. Adjustable VELCRO® Brand ONE-WRAP® rolls are strong, reusable, and designed for heavy duty indoor or outdoor use. Great for computer, appliance, and electronics wire management and organization. Custom cut to length for handling any bundling job. See the Product Specs tab for more information about this product. Beige 169984, Black 189755, Brown 173766, Green 176077, Lt. Grey 176075, Orange 176079, Purple 173765, Red 176076, Royal 176074, White 170015 & Yellow 176078. As a business in the data cable industry we require a certain type of velcro that will last and hold to certain standards. Well with this velcro we can get the job done and know it will stay the way we leave it for years to come. We've used others in the past and they come undone on there own and leaves our business looking embarrassed. This is a great product and I recommend it to everyone it will not let you down. Thank you a loyal customer for sure. This stuff works great! I'm using it extensively to hang my holiday garlands outside. Goes quickly & reduces the amount of time I have to spend out in the cold. Greatest plus is I can reuse the strips I cut. Tried to purchase this stuff elsewhere first & was told they ran out. Started to get panicky until I hit your web-site. Happy camper here! 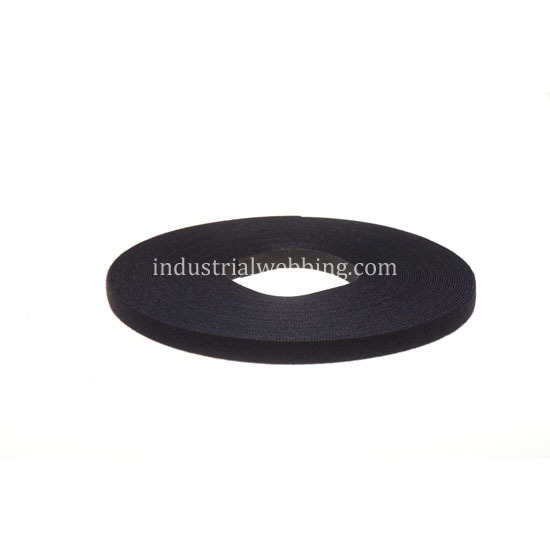 Industrial Webbing ships immediately and every order has been filled correctly. Their prices are competitive. What more could be asked of such a reliable vender? I have been buying whelping collars made from this velcro for $15 dollars for a small pack. Found this company and just purchased a roll in 8 colors. Will make me enough collars to last for years at an unbelievable price!